← Why are people moving to Nevada? How high will Reno-Sparks’ median home price reach in 2018? KOLO TV’s NewsNow Tuesday evening’s broadcast ran a segment on Northern Nevada’s 2018 Housing Outlook. As part of the report, Doug McIntyre, President of Reno/Sparks Association of REALTORS®, was interviewed. 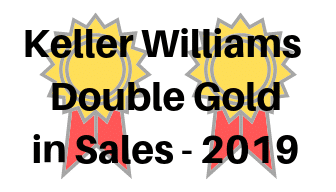 During the interview, Mr. McIntyre said he thought that our market’s median sales price would probably reach $400,000 this year. While everyone that I’ve talked with agrees that home prices will likely continue to climb this year, when it comes to answering to what level, that’s when people are less certain. Some see continued, but slowing growth. Others see the same rate of growth that home prices in our market have been experiencing. And some see accelerating growth. So what has been the increase in home prices in Reno and Sparks, Nevada over recent years? The chart below shows the annual median sales price by year from 2001 to 2017. As can be seen in the table above 2017’s median house price increased 10.5 percent over 2016’s median sales price. If 2018 was to see the same increase, then 2018’s median sales price would be $372,385. Keep in mind that these annual medians don’t show the monthly fluctuations in median price. The chart above shows 2017’s monthly medians [green line is four houses; blue line for condos]. 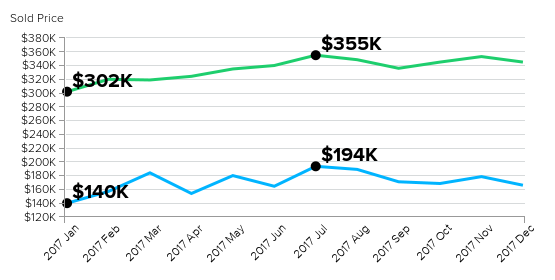 Looking at houses [green line], the year began with January sales exhibiting a median sales price of $302,000. Home prices then peaked in July with a median of $355,000; and the year then ended with a December median sales price of $345,000. But for sales across the entire year, 2017’s median was $337,000. If Mr. McIntyre’s prediction of hitting $400,000 were to happen, it would likely occur in our market’s peak months of June or July. What kind of appreciation would be required to reach a $400,000 median price? That depends from what number one is referencing. From 2017’s annual median price of $337,000 an 18.7 percent increase would be required. From December’s median of $345,000 a 15.9 percent increase would be needed. Possible? Unlikely? Probable? Looking back at December 2016, the median sales price that month was $300,000. 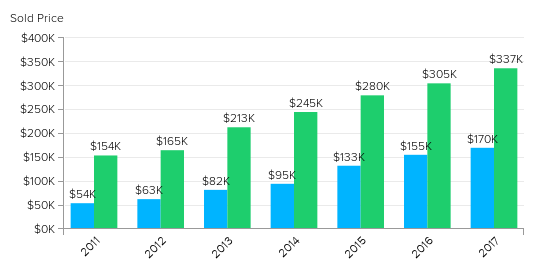 Over the next seven months the median climbed to reach $355,000 in July 2017. In absolute terms, that was an increase of $55,000. Coincidentally, adding the same increase of $55,000 to December 2017’s median of $345,000 yields the aforementioned $400,000 prediction. What is your prediction for 2018’s median sales price? Please share your thoughts in the comments below. Related post: Reno, Nevada’s Housing Shortage — How Bad Is It? Note: The median home price data reported covers the cities of Reno, Nevada and Sparks, Nevada [NNRMLS Area #100]. Residential data includes Site/Stick Built properties and Condo/Townhouse properties, as noted. Manufactured/Modular and Shared Ownership properties are excluded. Data courtesy of the Northern Nevada Regional MLS – January 3, 2018. Note: This information is deemed reliable, but not guaranteed. This entry was posted in Agent Insights, Market Trends and tagged reno median home price, Reno median sales price, sparks median home price, sparks median sales price. Bookmark the permalink. 2 Responses to How high will Reno-Sparks’ median home price reach in 2018? I along with a lot more residence In Washoe County would like to know when housing is going to become realistic as it sits at the prices right now I can not even afford a studio apt with what I currently make the prices have gotten so out of control here you can have a job and work hard to be homeless is thIs how Reno wants to be represented. Come work here in Reno and be homeless because the home prices are ridiculous. I don’t know if I’m the only one who sees this but businesses are closing down everywhere downtown is proof of that so in my opinion Reno is a dieing town with nothing to offer. The jobs can’t catch up to pay enough to live here and everything is closing down. The crazy part is that you make to much to get any help but not enough to afford a place to live forcing us to become homeless. What has the homeless rate rose to lately maybe somebody should take a look at that. This is not the American dream correct me if I’m wrong.